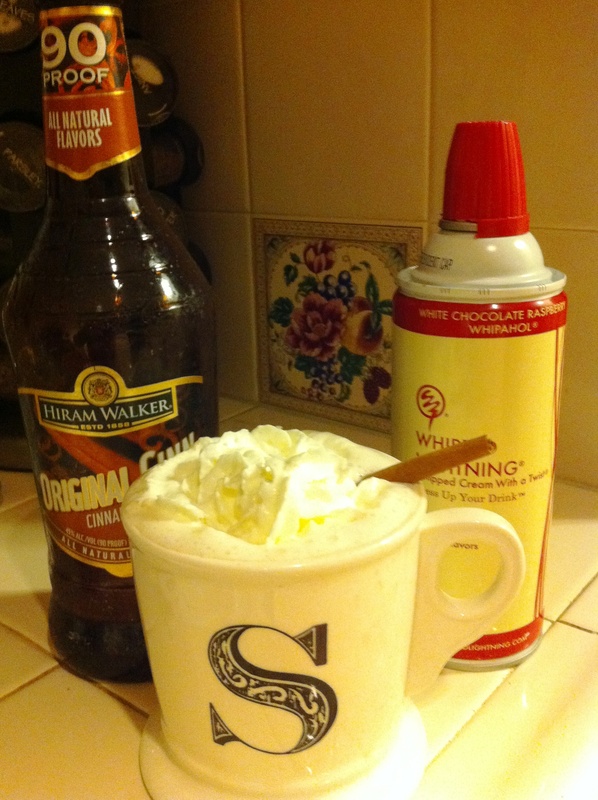 Hot Chocolate, Original Cinn, and alcoholic whipped cream – a winter match made in heaven! If you live anywhere in the Northeast, you’ve been bombarded by weather forecasts warning you to beware of the “crippling and potentially historic” storm that is heading our way. With the threat of 15+ inches expected to hit my little town in CT, I see this as a great opportunity to cozy up with a nice cocktail and watch the snow fall (or watch the dozens of shows left on my DVR). Hot Chocolate: When the cold wind is blowing outside your window and you’re bundled up on the couch, nothing warms you up better than a steaming mug of hot chocolate. Schnapps/Liqueur: Because all hot chocolate needs a friend… I recommend spiking your hot chocolate with Hiram Walker Whipped Liqueur, Peppermint Schnapps or Original Cinn Cinnamon Schnapps. Tea: Some people just don’t enjoy hot chocolate, while I don’t understand how this is possible, a piping hot tea can serve as a nice replacement to warm you up. Whiskey: Because like hot chocolate, tea needs friends as well. A personal tea-favorite of mine is a hot toddy with Jameson Irish Whiskey. Red Wine: When all else fails, a nice glass of red wine works wonders in the winter cold, especially when warming up by a toasty fire. I hope all of you Northeasterners stay safe and warm during the storm!